In the case of damage, repairs to fur garments should be made as quickly as possible. As professional furriers, the experts at Broms Furs & Fashions have the training, experience, and tools to address any repair issue. Let us breathe new life into your fur! It is far more expensive to replace a fur coat or accessory than it is to have it mended. Although furs are easily damaged by a number of natural enemies, such as mold, insects, and rodents, most repair work is inexpensive and relatively easy for a professional furrier to complete. Broms Furs & Fashions will inspect every element of your garment and provide you with an accurate estimate before beginning any repairs. Our master furrier can repair rips, tears, loose hooks or buttons, and more. At the first sign of a rip or tear, we recommend bringing in the fur immediately. For less serious worn edges, we will make your fur look new again! The most common mistake of fur owners is seeking repair services from tailors or seamstresses. These professionals often repair damage from the outside, as if they were mending cloth. In the end, they cause even more costly damage. Professional furriers know the lining must be opened so that rips and tears can be sewn shut from the inside. Rips and tears are among the most common repairs our team provides. By contacting Jeff Broms, you will avoid making small problems worse and receive top-quality repairs that last. 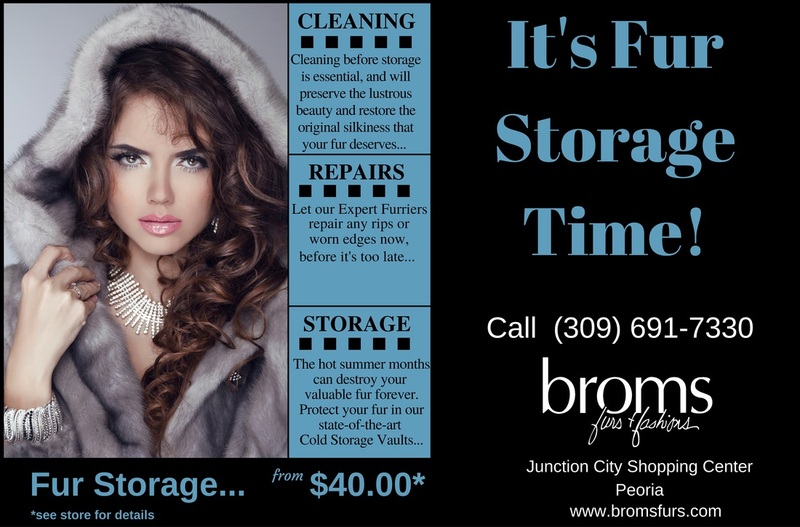 If you need fur repair in the Peoria, Bloomington, Springfield, and surrounding Central Illinois Area, Broms Furs & Fashions can help. Our master furriers can address any issue you might have and add years of life to fur garments and accessories. Please call us at (309) 691-7330 to schedule repairs right away. We offer a variety of other fur services that will extend the life of your garment.